Brussels, 31 March 2016. Europe’s ongoing failure to find humane responses to the plight of refugees has led to severe difficulties in ensuring reception for those seeking asylum, according to the latest report of the Asylum Information Database (AIDA). The report documents the situation in 20 European countries: Austria, Belgium, Bulgaria, Cyprus, Germany, Spain, France, Greece, Croatia, Hungary, Ireland, Italy, Malta, the Netherlands, Poland, Sweden, the United Kingdom, Switzerland, Serbia and Turkey. A central challenge to the operation of reception systems has been the obligation of states to identify vulnerabilities and provide appropriate reception to persons with special needs. Vulnerable persons such as unaccompanied children have been unduly subjected to detention due to the unavailability of appropriate reception places, not least in countries of first arrival. The implementation of the ‘hotspot’ approach in Italy and Greece has reinforced the risk of detention of asylum seekers and migrants, contrary to states’ obligations. 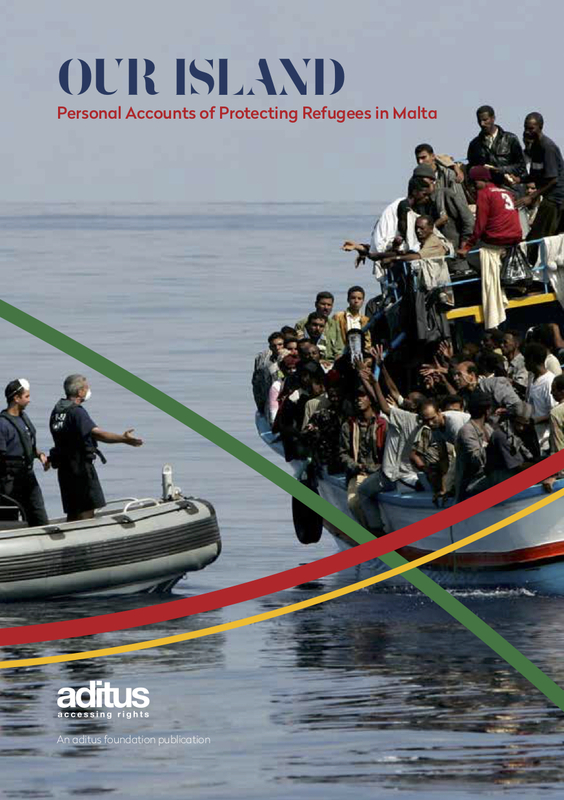 The Malta report was written jointly by aditus foundation and JRS Malta. Notes to Editors: The Asylum Information Database (AIDA) is a database containing information on asylum procedures, reception conditions and detention across 20 countries. This includes 17 European Union (EU) Member States (Austria, Belgium, Bulgaria, Cyprus, Germany, Spain, France, Greece, Croatia, Hungary, Ireland, Italy, Malta, Netherlands, Poland, Sweden, United Kingdom) and 3 non-EU countries (Switzerland, Serbia, Turkey). On Friday 16 October ECRE’s General Assembly unanimously elected our Director, Neil, to its Board. Representing ECRE’s members from the Mediterranean Region, Neil joins colleagues who represent ECRE’s entire membership across Europe, to advocate for increased refugee protection throughout the region. “This is a great honour for me! It is also an opportunity to bring to ECRE the voice of a small Member State that has experienced serious difficulties in meeting the challenges presented by boats of refugees landing at our shores. The European Council on Refugees and Exiles (ECRE) is a pan-European alliance of 90 NGOs protecting and advancing the rights of refugees, asylum seekers and displaced persons. Our mission is to promote the establishment of fair and humane European asylum policies and practices in accordance with international human rights law. Brussels, Athens, 26 November 2012 – With immigration detention a growing issue across Europe, NGOs from 15 EU countries gathered in Greece to discuss ways to prevent the damaging and unnecessary detention of migrants, asylum-seekers and refugees. Greece was chosen to host the meeting due to international criticism on its migration and detention practices. The group concluded that immigration detention is widespread across the EU and than in spite of the existence and clear economic advantage of alternatives, they remain vastly unused. The workshop concluded with the decision to constitute a working group on detention in the EU. The International Detention Coalition (IDC), with collaboration with the Greek Council for Refugees (GCR), brought together over 20 organisations from 15 EU Member States for the first-ever European Union workshop on immigration detention in Athens, Greece on the 22th and 23rd of November. The aim was to develop a regional civil society strategy and action plan on detention, as well as share concerns and priorities on the issue. Participants included European NGOs such as the European Council for Refugees and Exiles (ECRE), the Jesuit Refugee Service (JRS), Amnesty International, the Hungarian Helsinki Committee, and France Terre d’Asile, as well as the United Nations High Commissioner for Refugees (UNHCR). During the two days, the over 45 participants discussed the different immigration detention policies and practices in place in EU Member States such as Belgium, Bulgaria, Greece, Italy, Malta, the Netherlands, Romania and the UK and shared relevant national statistics on the issue. The new EU legal framework on reception conditions, procedures and return was extensively discussed, such as the lack of a specific ban on the detention of children and of a maximum timeframe for immigration detention. The organisations used the second day of the workshop to identify common issues of concern and vulnerable groups, as well as creative ways to advocate for the improvement of national and EU legislation towards ending unnecessary immigration detention. One of the main concerns identified was the continued detention of migrant children, including unaccompanied minors, and other vulnerable groups such as victims of torture and trafficking and migrants with special health issues in the EU. In this context, one of the advocacy initiatives mentioned was the Global Campaign to End Immigration Detention of Children. The Campaign has already been endorsed by 80 organisations, including ECRE and Amnesty International, and is asking States to stop detaining children, individuals to take action by signing a petition and children to record video messages of support for children in detention. Another clear concern was the seldom employment of alternatives to detention either already in place, or potentially accessible at a national level. Thus, the need for further exploration and development of alternatives to immigration detention in the EU came out a priority for the organisations present at the workshop, as well as for IDC, on a more global level. Some statistics and practices have been of particular relevance and interest. For instance, in France, detention practices on the European mainland differ from the “extra-European territories”, such as Reunion, Guyana and Mayote, where there is no effective judge control, limited legal assistance and almost inexistent transparency. Similarly, there were over 5,000 children placed in immigration detention in Mayote in 2011, although France has a clear policy against child immigration detention. In Italy, detention conditions depend on the agreements and policies of the private entity that runs each “Centre for Identification and Expulsion”. Therefore, some centres don’t allow detainees to wear shoes, some ban the use of smartphones and some make male detainees go into an actual cage in order to shave. Last year, there were 7,735 people in immigration detention in Italy. In Greece, detention is a widespread practice applied to undocumented migrants and asylum seekers automatically, indiscriminately, often times in inhumane conditions, and almost as a punitive measure. The detention of children is not expressly banned under Greek legislation, so that during 2011, in only one detention center on the border, Filakio detention center, Evros region, a total of 572 unaccompanied minors have been detained. Moreover, the Greek legislation has recently changed in order to increase the maximum period of detention for asylum-seekers from three months to 12 months, an amendment meant to discourage the submission of asylum claims. In addition to that, the widely obstructed access to the asylum procedure, due to the practice of Greek authorities to refuge receiving and registering more than twenty asylum applications per week, often results in the extension of detention given that numerous potential asylum seekers have no access to lodging an asylum application. This results in their first contact with Greek authorities being in the form of a return decision that includes a detention provision. The United Kingdom is the only European Member State that practices indefinite immigration detention, where some 160 persons have currently been in detention for over a year. However, the UK has also recently introduced a family return process that aims to promote voluntary return and minimize the use of detention. Some countries like Malta, the Netherlands and Greece, are continuing to regard detention as one of the most effective migration management tools, and some like Belgium, Denmark, and Sweden are increasingly identifying and implementing Alternatives to Detention (ATD), such as open accommodation centers and case management. The European Council on Refugees & Exiles (ECRE) welcomed aditus foundation and JRS Malta as their 2 new members, extending their reach into Southern Europe. “This is excellent news for us, a confirmation of the role we’re playing in supporting asylum-seekers & refugees in Malta. Through our membership with ECRE we’re keen to engage in more active advocacy efforts & to team up with like-minded organisations all over Europe”, says Dr. Neil Falzon (aditus Director). Our membership with ECRE, as well as our participation in its meetings & training events, was made possible thanks to the support from the Malta-EU Steering & Action Committee (MEUSAC).